Your preferred driving position (the position of the driver’s seat and angle of the outside rear view mirrors) can be memorized and recalled by pressing a button. 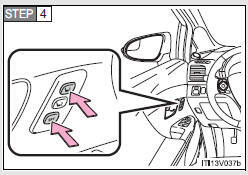 It is also possible to set this function to activate automatically when the doors are unlocked. Two different driving positions can be entered into memory. Turn the “ENGINE START STOP” switch is in IGNITION ON mode. Vehicles without smart key system: Turn the engine switch is in the “ON” position. rear view mirrors to the desired positions. While pressing the “SET” button, or within 3 seconds after the “SET” button is pressed, press button “1” or “2” until the signal beeps. Press button “1” or “2” to recall the desired position. The auto away/return function enables easy access by activating when the driver attempts to enter or exit the vehicle. • The shift lever has been shifted to “P”. • Vehicles with smart key system: The “ENGINE START STOP” switch has been turned off. Vehicles without smart key system: The key is removed from the engine switch. • The driver’s seat belt has been unfastened. ► Auto return function (entering the vehicle) When either of the following actions has been performed, the seat will move forward: • Vehicles with smart key system: The “ENGINE START STOP” switch has been turned to ACCESSORY mode. Vehicles without smart key system: The engine switch has been turned to the “ACC” position. • The driver’s seat belt has been fastened. Memorized seat positions can be activated up to 180 seconds after the driver’s door is opened and another 60 seconds after it is closed again. • Press the “SET” button. • Press button “1” or “2”. • Adjust the seat using the switches. When the seat is in the most forward or most backward position, and the seat is being moved in those directions, the system may not correctly recognize the current position and the memorized position will not be correctly recalled. 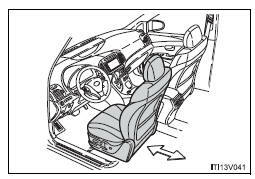 If the seat is already close to the rearmost position, the auto away function may not operate when the driver exits the vehicle. The memorized positions are erased when the battery is disconnected. The auto away function for driver’s seat may be disabled.